On the other hand, there’s the good feeling that comes with knowing that there are a few things you can do to attract potential home buyers to your property. Even better than that is the fact that low-cost home improvements exist that you could complete that could perfectly seduce a potential buyer. Granted, a large-scale remodeling project will certainly raise the value of your home, and buyers will definitely be lured to it, but the process will also break the bank, not to mention that payback isn’t guaranteed. On top of that, prospective buyers might not like your version of remodeling because tastes do differ. Yet the low-cost home improvements are pretty simple. Some you can even carry out on your own and when they are taken collectively, chances are high they could expedite the sale of your property and bring you a reasonable profit from it. Below are the top 5 low-cost home improvements you should consider when selling your home! Great landscaping can be create an impressive first impression. Based on a survey done by the National Association of Realtors in 2013, 71% of home buyers consider curb appeal when shopping for a home. So, unless your house is a fixer-upper, you owe serious buyers an inviting home. Once they begin to tour your property, your landscaping should evoke excitement. Thankfully, there are quick and inexpensive curb appeal projects you can do to achieve that. For a couple of hundred dollars, you can enlist the help of a landscaper to plant some flowering annuals, in addition to carrying out a full yard cleanup. Many would, of course, want to know about the return on investment from such a landscaping project. Well, a quick web search puts the numbers between 100% and 1000%. More important to note is that the results tend to be impressive when you develop a landscape plan that compliments the architectural design of your home. Even though you have a chance to do an extensive landscape, bear in mind that some buyers can treat that as a negative factor due to the high maintenance cost it attracts. This is especially the case for millennial home buyers. Low maintenance costs are one of the top things millennial home buyers are looking for in a home! Let’s face it, freshly painted rooms are a natural attraction. A clean and updated exterior too can also be alluring. And guess what? A simple paint job or scrubbing of the walls using proper tools and cleaning agents can bring exact results to your home. When it comes to painting, it’s important that you choose the right type and pick your colors wisely. Not too long ago, Zillow did analyze well over 32,000 images of sold homes and their finding was that rooms painted in light shades of blue, pale blue or gray, and powder blue sold way above the expected price ($5440 on average). The same report found out that blue kitchens, light blue bathrooms, brown living rooms (pale taupe, beige, or oatmeal-colored walls), cadet blue bedrooms, slate blue dining rooms, greige home exteriors, and navy blue front doors raised the value of a home by more than $1000. Thus, by opting to go with such colors, you will likely attract a huge number of potential property buyers. Give the attention and number of visits they attract, bathrooms and kitchen are the top candidates for a full paint job. Don’t forget to select the right shade for each. You can do the painting yourself or hire a pro to do it for a few hundred dollars. However, if you cannot afford fresh paint or your walls are still in mint condition and only have fingerprints, marks, dings, and the like, washing them can still go a long way in giving them a desirable look. Does your living and dining room have those dull recessed lights? If yes, this is the time to unscrew them and fix a brilliant replacement in their place. Chandeliers would be a great option to consider. If your other rooms have aged light bulbs, consider swapping them out with new ones that have proper voltage for the kind of fixtures in the room. You may also consider adding energy efficient bulbs and fixtures. This is one of the best ways to make a home more energy efficient which is desired by many buyers nowadays! You may also consider adding more lamps and fixtures such as under cabinet lighting, desk lamps, bedside lamps, accent lighting, and tread lighting. Considering that showings often happen at different times of the day, also put into consideration natural lighting. Examine your curtains and blinds to ensure they are not impeding what natural light you could have in the room. Being a key part of curb appeal, exterior lighting also matters. Make it well lit by adding things such as path lighting to create a welcoming impression. Lastly, note that dark furnishings, flooring, and wall and ceiling colors are known to interfere with room lighting. To be on the safe side, enlist the help of an interior designer. Let them audit these aspects to ensure they are optimized for their function. It’s true that a kitchen is the heart of every home, which is why many potential home buyers prioritize it over other rooms. If you update every other room to be clean and appealing, then spruce up your kitchen with low-cost cosmetic upgrades, more potential buyers will be encouraged to buy your house and the selling price will be higher. A complete renovation of your kitchen sounds like a good idea, but the flip side of such a project is that it’s expensive and doesn’t guarantee reasonable returns. However, with just a few dollars, you can carry out the following upgrades and still get the best resale value. Paint – Baseboards, kitchen cabinets, trim, moldings, and entryways are among the few kitchen areas that often require a fresh coat of paint to keep the kitchen glowing. Earlier on, we saw that blue kitchens tend to deliver relatively excellent results, so when you select a paint color, have that in mind. Depersonalize – If you have personal photographs, political or religious décor, memorabilia, artwork, and the like, it’s best to remove them so as to give prospective buyers touring the property a chance to envision their own lives in your home. Replace old kitchen appliances – Replacing dated dishwashers, microwave ovens, humidifiers, and an air conditioner(s) is one way to give your kitchen a fresh look and make it look more functional. Clean the countertops – Examine your countertop for cracks, nicks, grout issues, etc., and if present, perform the necessary action(s) to fix the issue. Sand and oil it to get rid of butcher block. Clean it and clear it off if need be. However, in the event you have to replace the countertops, granite is one of the greatest option to take into consideration. Other inexpensive updates you might want to consider include sprucing up the backsplash by adding tiles that complement the theme of your kitchen and swapping outdated cabinet pulls and drawers with new ones. Bearing in mind that your home could be purely vacant, flooring is among the things that count as far as first impressions goes. Once a buyer steps inside the home, they will probably see the floor first. Many floor types naturally take a beating over time and if yours looks worn, that might turn off a potential buyer. Is there a way to avoid that? Yes, absolutely! Flooring stores and home centers do sell water-based products for renewing different floor types and they cost just a couple of hundred dollars. An old or stained carpet is a definite turn-off, especially to prospective homeowners who plan to settle with their pets. Hire a professional to clean it, but if that doesn’t do the trick, consider getting a fresh new carpet. 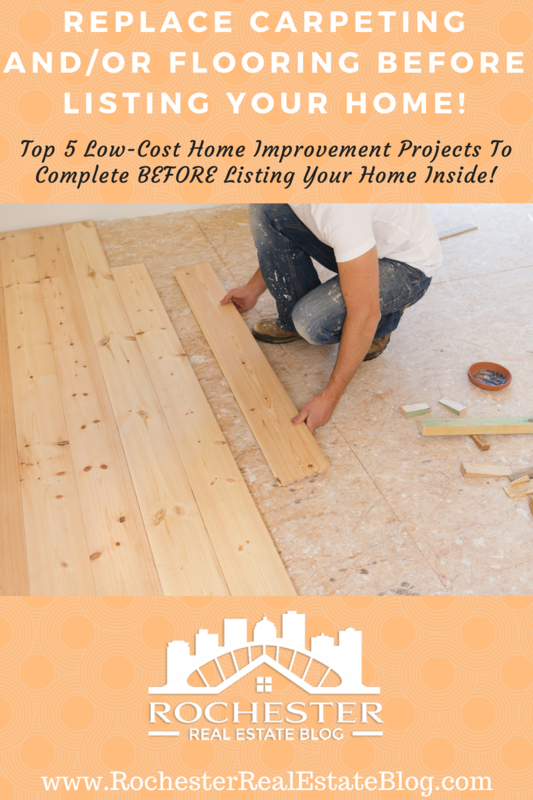 One thing that makes these five low-cost home improvements unique is that all have the potential to immediately change the buyers perception of your home and raise its value. That aside, none of them will empty your pockets as complete renovations would. In fact, you can spread out the cost and do one update/upgrade at a time until the time you are ready to sell the house. Do you need additional advice or information on other rewarding low-cost ideas that you can make before selling your home? Please speak to a real estate professional. They’ll be glad to share their expert knowledge and experience. About The Author: The above article “What Low-Cost Home Improvements Should You Make Before Selling Your Home?” was written by Sabine Ghali is Director at Buttonwood Property Management, a property management company in Toronto. She is an entrepreneur at heart who endeavors to help investors create real estate wealth over time in the Greater Toronto Area. Sabine is published in a number of media outlets, including Toronto Sun and Gulf News, among many others.